Jochen Benzinger is known for his extraordinary creations, many of which use elaborate colors and designs. 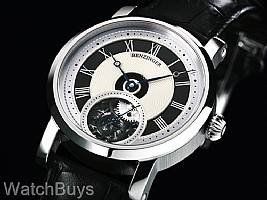 But we must admit, the Jochen Benzinger Tuxedo is different from other watches in the Benzinger Collection. Yes, it retains all of his traditional arts of engine turning, engraving and skeletonizing - but at the same time this watch goes where no Benzinger watch has gone before - its primary focus is simplicity and a very direct color scheme of silver and black. We've named this new watch the Tuxedo because we think it exudes sophistication and class. You'll notice that the dial is actually not one dial but two - Jochen has used a layered approach to create a completely hand guilloched sterling silver dial that appears to float from the center of the watch. The inlaid black chapter ring with contrasting silver Roman numerals completes the look. Take a look at the small second hand at 6. Jochen has cut out this portion of the dial to reveal the skeletonized movement, and in keeping with the color scheme of the watch both the hour wheel and the visible second gears are in black with contrasting silver. The movement is hand skeletonized and hand engraved using many patterns, with the ground plate coated in black PVD to provide a stark contrast to the silver bridges, wheels and gears. The screws are flame blued as are the hands, and you'll find yourself staring at the movement long enough to miss meeting start times (which might be a good thing). With this watch Jochen proves again why his old world craftsmanship skills are among the elite in his profession. Everything is done by hand, using original engraving and engine turning machines, many of which are antiques. 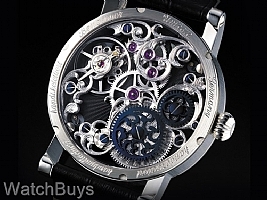 You can learn more about how Jochen Benzinger creates watches by clicking here. You'll also see the very machines and workshop where he works. This watch is manually winding with a power reserve of 44 hours, and features a sub seconds hand at 6. Sapphire crystals on both sides. The presentation box is elaborate, and naturally features engraved plates describing and naming the watch.